In our day of Social Media--LeRoy's death was reported by Dwaine Boins this morning on Facebook. Will update as I have more info. A truly kind and gentle spirit--a powerful athlete--always a smile and happy greeting in the halls of NHS. 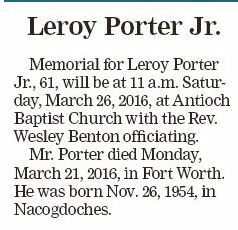 I will remember LeRoy fondly. We have lost one of our family. Services Saturday March 26 at 11 AM at Antioch Baptist Church on Greer St in Nacogdoches.